Growing up in the small town of Beaufort, I was used to making the 30 minute drive to Savannah to go to the mall. Beyond that, our family didnt' really spend that much time in this Georgia city. Last night I had to make my way from the Island to Savannah for a client event. The event itself was amazing. 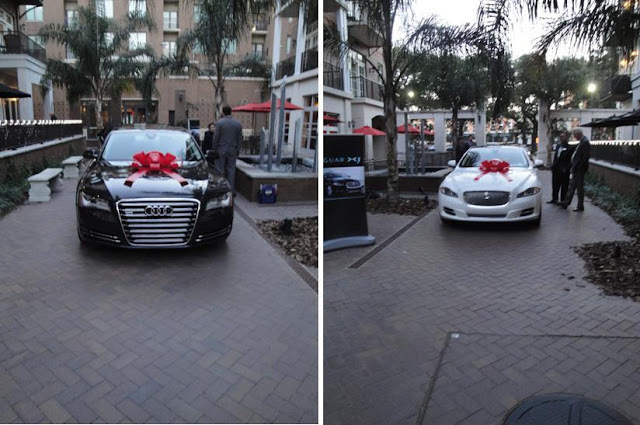 It was held at the mouth-watering Ruth's Chris Steakhouse and as wine was sipped and slices of ahi tuna and rare steak passed around....the attendees oooohed and aaaahhhed over the "guests of honor" - a 2011 Audi A8 and a 2011 X-type Jaguar. The event was a success. It was the drive home that didn't go as planned. After making my way out of the 16-degree weather (South Carolina and Georgia are currently pretending they are Chicago) and out of the parking garage, I followed the sound of the GPS lady to "drive to the nearest hilighted route." It was minutes later when I realized the GPS was not bringing me the way I had come and none of the streets it was telling me to turn on matched the real street names....mini panic began to set in as I tread further into the very deep ghettos of Savannah. With one-way roads as my only option, I called my parents and told them "I have no idea where I am" and the "GPS is confused." Just what every parent wants to hear from their 25-year old daughter at night. My dad told me to keep a level head and jumped on google maps to help navigate my way as my mom stayed with me on the line. She asked me "What do you see?" As I looked to my right and left, I said "crack houses on the left and whore houses on my right." I'm sure she was greatly comforted by this. She asked me if I saw a street address but I said no - I believe those kind of establishments generally like to fly under the radar. With no help from the GPS and an untimely decision by my phone to randomly shut off (technology of any kind hates me - i've had three computer viruses, a hacked email and 7 phones in the last year), the three of us were able to navigate me to a neighborhood with homes that didn't sport a lawn couch and roads with street lights. But ya'll, being lost in the hood is sa-cary stuff! I do not reccommend it. Oh Savannah, I will NEVER understand the charm others see in you....your poorly-lit sketchy neighborhoods and one way cobblestone streets that catch my heels every time get no love from me. ummm, glad you made it out alive! !